Noel Mullins is a freelance photo-journalist, and is the author of ‘The Origins of Irish Horse Fairs & Horse Sales’, which is a historic and photographic account of traditional horse fairs and horse sales in Ireland over 3,000 years. He is also the author of ‘Horse Tales & Hunt Talk’, which is a compilation of 31 biographies of well know equestrian personalities in Ireland, America, France and Australia. A native of Loughrea in County Galway, Ireland, although his business career was as head of marketing for the computer services company IBM Ireland, he has been associated with horses all his life, hunting with the Galway Blazers from an early age. He has hunted two packs of beagles, and also hunted a mounted pack for over 20 seasons. He is hunting correspondent, and a feature writer for The Irish Field, and has reported on equestrian events in Ireland, Britain, France, Italy, Germany, North America, Dubai, The Czech Republic, Argentina, Brazil, Chile, Australia and New Zealand. 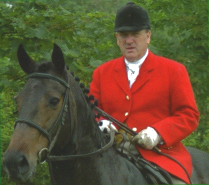 His work has been published in The Irish Field and The Farmers Journal in Ireland, Horse & Hound, Hunting & Country Illustrated, Hounds Magazine and Baily’s Hunting Directory in Britain, The Chronicle of the Horse, Foxhunting Life, Covertside, Blarney, and Horse Country in America, and Gulf News in Dubai. In 2005 he appeared as huntsman in the opening scenes of the remake of the film Lassie starring Peter O’Toole. In the film he rode his favourite hunter Walter to whom he dedicated his horse fairs book. In 2006 he delivered a paper at the invitation of the Royal Dublin Society Speaker Series on ‘The Origins of Irish Horse Fairs’, together with a public exhibition of his photographs taken at some of the last remaining Irish horse fairs. In 2008 he was awarded the John H. Daniels Research Fellowship by The National Sporting Library in Middleburg, Virginia, USA to study their collection of first edition books and original manuscripts of the two Irish lady authors Somerville & Ross. He gave a lecture to a large audience at the National Sporting Library on ‘The Humour in the Literature of Somerville and Ross lives on in Foxhunting today’. In 2009 he gave a talk to The Irish Draught Breeders of North America at Denny Emerson’s Equestrian Centre in Vermont, USA on the Irish Horse, illustrated by a series of action photographs taken in the hunting field, and at the Royal Dublin Society Annual Horse Show. A Member of The Library and Archives Committee of the Royal Dublin Society, he still takes a keen interest in the development of the library and their exhibitions. In 2014 he was guest speaker at the international meeting of the followers of the Sister Fildelma series of mystery books by writer Peter Tremayne. The subject of the talk was ‘The Origin’s of the Irish Horse up to the 7th Century’. In that year also he participated in a film for French Television on the Irish Horse titled, C’est Pratique: La Venerie: Unsport Meconnu. 2014 was also a year that marked the centenary of the beginning of World War I and as a result of writing about War Horses and the Irish Remount Depots at the Royal Dublin Society Grounds, and Lusk, County Dublin that supplied and trained horses for the war, Mullins was invited to be interviewed for the BBC program ‘World War I: War At Home’ series. He has given talks to numerous Historical Societies, and been featured on Irish Radio in interviews on foxhunting, horse fairs and other related equestrian matters. His books are in collections in many countries around the world, and also in Public Libraries, and State Institutions, and in the libraries of a number of Heads of State including the President of Ireland, the White House and Buckingham Palace.